Transformers: The Movie is set in the year 2005, almost 20 years after the concluding events of Transformers' second season. 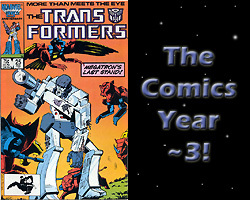 It begins at a time when Megatron and the Decepticons having taken over Cybertron, attempt to wipe out the last remaining Autobots on Earth and two of Cybertron's moons. The movie is the stage where many new characters are introduced including Hotrod, Kup, Blurr, Ultra Magnus, Springer, Cyclonus, Scourge, (and many others) as well as the new leaders of the Transformers: Galvatron and Rodimus Prime. The movie also featured the ultimate bad guy of bad guys, a name all TF fans should recognize: UNICRON! Donny Finkleberg (Robot Master) escapes D custody, but is being tracked by Ravage. Skids, lost in battle last issue, is discovered by Charlene. 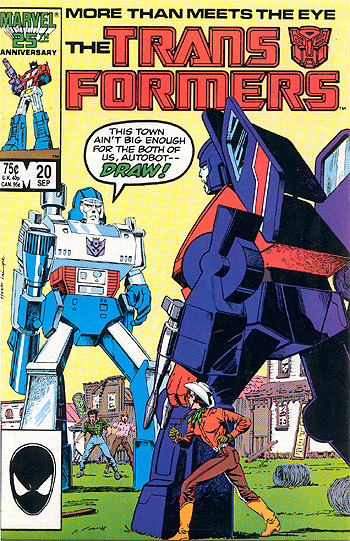 When Donny wanders into town, it’s Skids vs. Ravage. 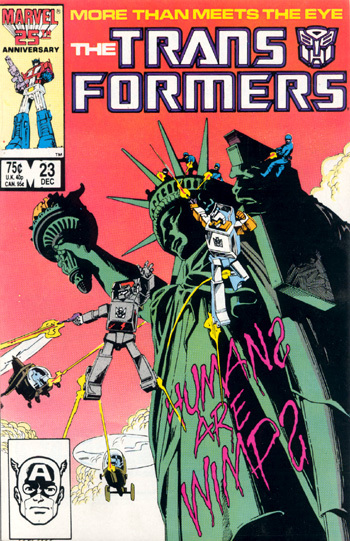 Issue #21 cover AERIALBOTS OVER AMERICA! 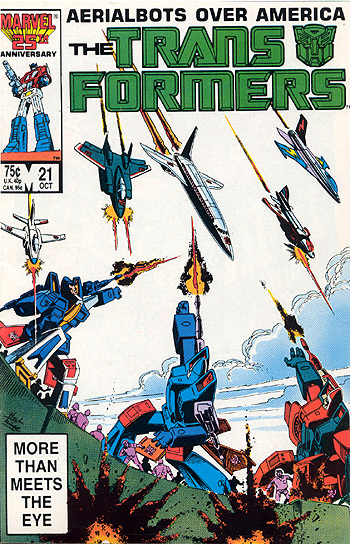 by: Bob Budiansky, Don Perlin, Ian Akin and Brian Garvey Introduction of the Aerialbots, Jetfire searches for new Autobots trapped on Earth. Circuit Breaker reveals how she captured Perceptor, Blaster and others. 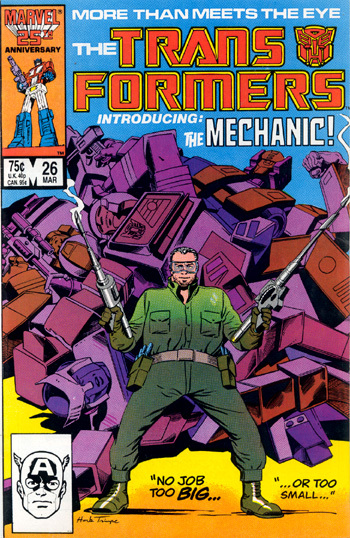 Optimus is injected with a cerebro-shell and when he uses the creation matrix to give life to the Aerialbots, he unknowingly gives life to the Stunticons. 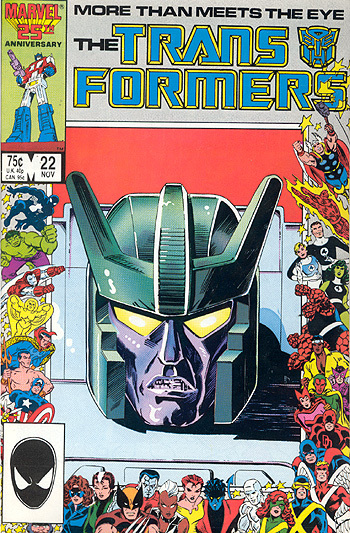 Issue #23 cover DECEPTICON GRAFFITI! by: Bob Budiansky, Don Perlin, Ian Akin and Brian Garvey Runabout and Runamuck are sent to deliver a message, so they follow a boy on vacation and write Binary graffiti on all the important American landmarks. Circuit Breaker takes control of an amalgam of A parts she captured to attack the two D’s. Issue #24 cover AFTERDEATH! 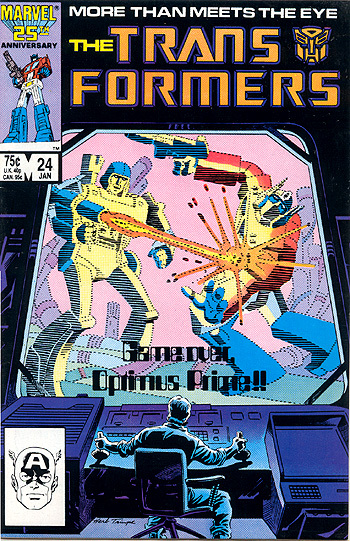 by: Bob Budiansky, Don Perlin, Ian Akin and Brian Garvey When the Combaticons and Protectabots start to fight in an industrial area, Optimus and Megatron agree to fight inside Ethan Zachary’s computer game, with the loser being destroyed for real. Will the D’s cheat, and will anyone catch them? issue #25 cover GONE BUT NOT FORGOTTEN! 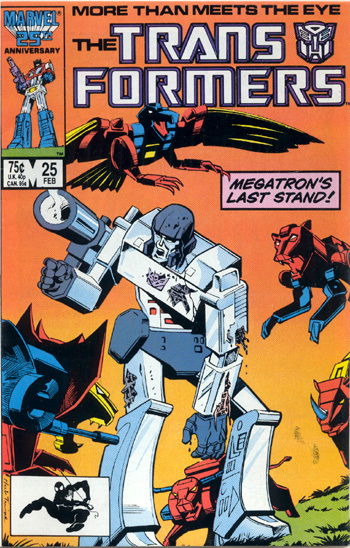 by: Bob Budiansky, Don Perlin, Ian Akin and Brian Garvey Megatron goes insane thinking Optimus is still alive and tricking him. Shockwave sends for the Predacons to help push Megatron over the edge. issue #26 cover FUNERAL FOR A FRIEND! issue #27 cover KING OF THE HILL! 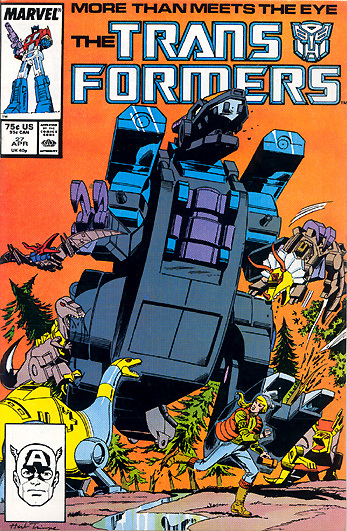 by: Bob Budiansky, Don Perlin, Ian Akin and Brian Garvey Trypticon (and Wipe-Out) is sent to Earth, but the Dinobots turn the tide and send him back to Cybertron. Grimlock is named new leader of the A’s. The Dreadnoks attack Power Station Alpha, but Megatron has even more in store. 2: POWER STRUGGLE by: Michael Higgins, Herb Trimpe, Vince Colletta Cobra takes control of Power Station Alpha, bringing it to their base, but it was followed by Dirge and Bombshell. 3: ASHES, ASHES... by: Michael Higgins, Herb Trimpe, Vince Colletta Shockwave creates an alliance with Serpentor, but what does Shockwave have planned? 4: ...ALL FALL DOWN! by: Michael Higgins, Herb Trimpe, Vince Colletta The A’s join forces with Cobra and G. I. Joe to try and stop Shockwave from destroying Earth. Also, Bumblebee is rebuilt as Goldbug.